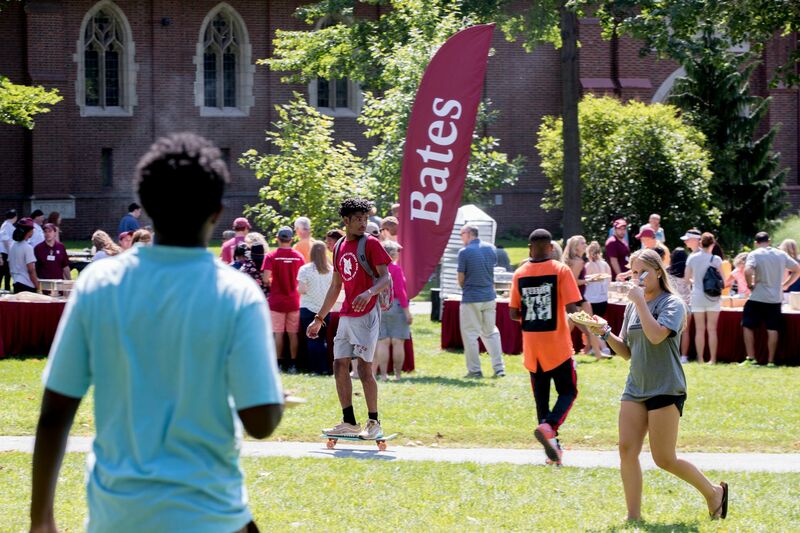 Opening Day for the Class of 2022 was Monday, Aug. 27, and the Bates community turned out in friendly force to welcome and guide Bates’ newest students. Follow along as Bates Communications photographer Phyllis Graber Jensen, teaming with writers Doug Hubley, Emily McConville, and Jay Burns, captured the day in words and images. Some of the first customers at Forage, a popular Lewiston coffee spot, were Belle Bernhoeft-Gutierrez ’22 and her parents, getting a leisurely start to what would be a packed day. 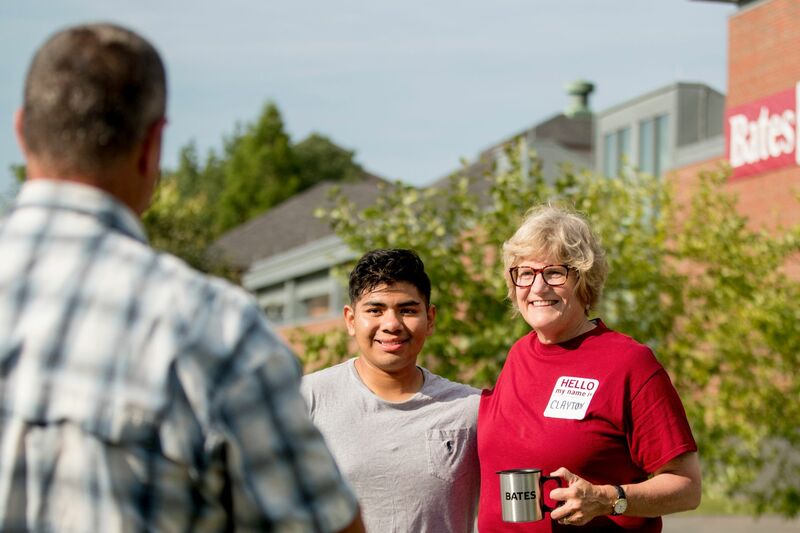 The family had flown in from São Paulo, Brazil, over the weekend, and Bernhoeft-Gutierrez, as an international student, was able to move in early. They’d tried to get their bearings on campus the day before. “People keep referring to things, and I just nod and smile for a little while,” Bernhoeft-Gutierrez said. They had marveled at the New England brick buildings, the Gomes Chapel, and the friendliness of the people. “Everyone was really nice, from Security who helped me open my room to students that were walking by,” said Bernhoeft-Gutierrez. 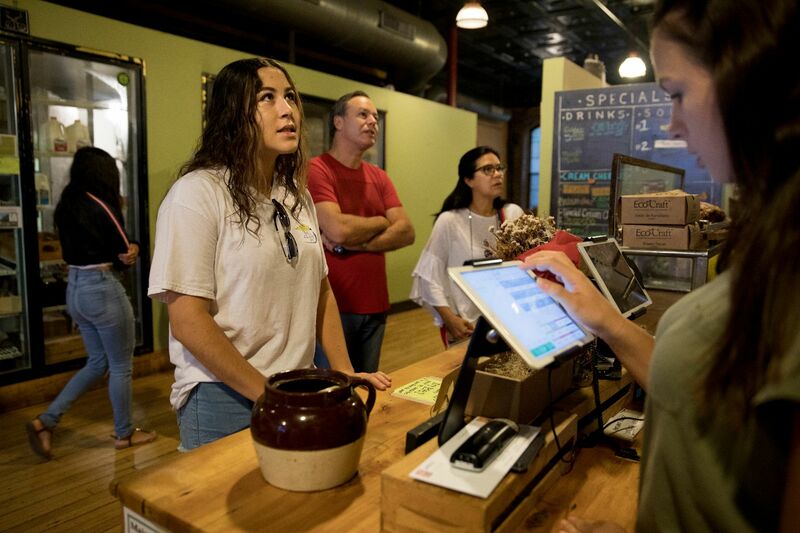 As they ate Forage’s bagels and breakfast sandwiches and talked about the experience of dropping their oldest off at college, her parents, Carmen Bernhoeft and Gregorio Gutierrez, teared up. “The best way I have found to describe it is, it’s the only time in life you feel so happy and so sad at the same time — and so proud,” Gutierrez said. 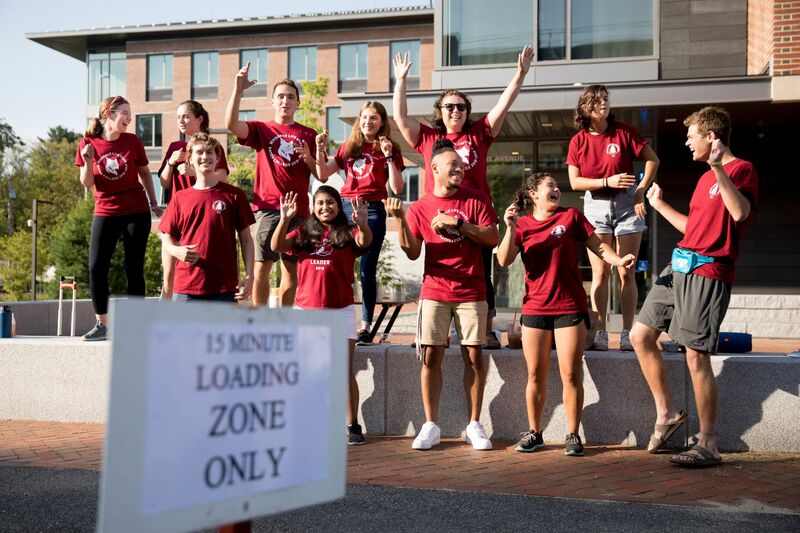 As family cars bearing new first-years pulled up at Chu and Kalperis halls, the high energy among the Opening Day student helpers got a bump from loud pop music from tiny speakers, Dunkin’ Donuts Munchkins, and well-stocked hydration stations. Milan Lemon ’21 of Plantation, Fla., said that the new-student influx had started right on time at 7 a.m., and about 40 first-years and families had arrived since then. 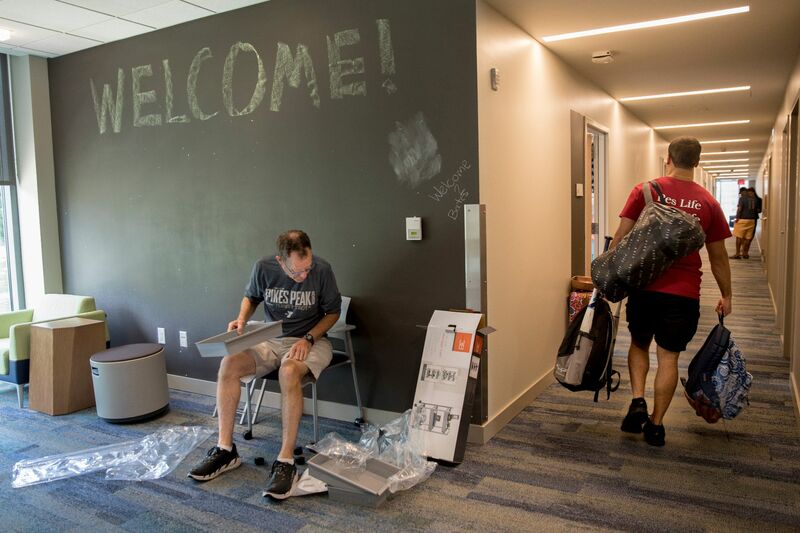 Progress was smooth and the new students “were excited to move in,” he said. A few seconds later, there was a boisterous “Yay!” from student greeters as another family arrived. Half-a-dozen or so student, including Breen, descended on the arriving vehicle. The campus-wide goal for unloading each new student’s car was 15 minutes. Inside Commons, Stacia Poulin (right) of the college’s Dining, Conferences, and Campus Events office helped Gilleyanne Davis-Oakes ’22 of Vinalhaven, Maine, get squared away. Her mother, Wanda Davis-Oakes, watched as Alex Campbell ’22 of Garden City, N.Y., waited his turn. Nearby, Jenny Graves, business manager in the events office, reported about 30 students having signed in so far, from as far away as Hawaii and as near as the Maine towns of Falmouth and North Yarmouth. 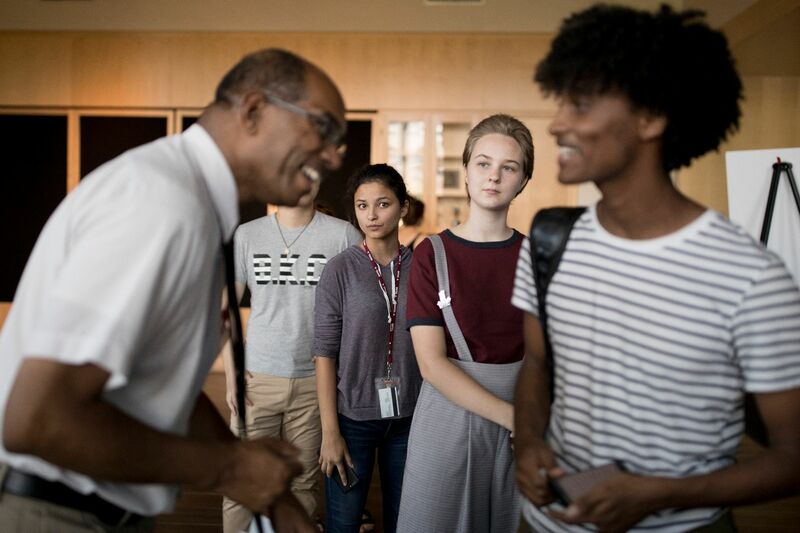 Outside Commons on Campus Avenue, Bates President Clayton Spencer joined the Bates Welcome Crew — staff who help with Opening Day — greeting students as they were dropped off by family members. She met Enrique Dolores ’22 of Hailey, Idaho, as he went to check in at Commons, joined by his godfather, Bob Knoebel. Dolores already had a good sense of where things were on campus — he’d been on campus for a week with the Bobcat First! program. Bobcat First! 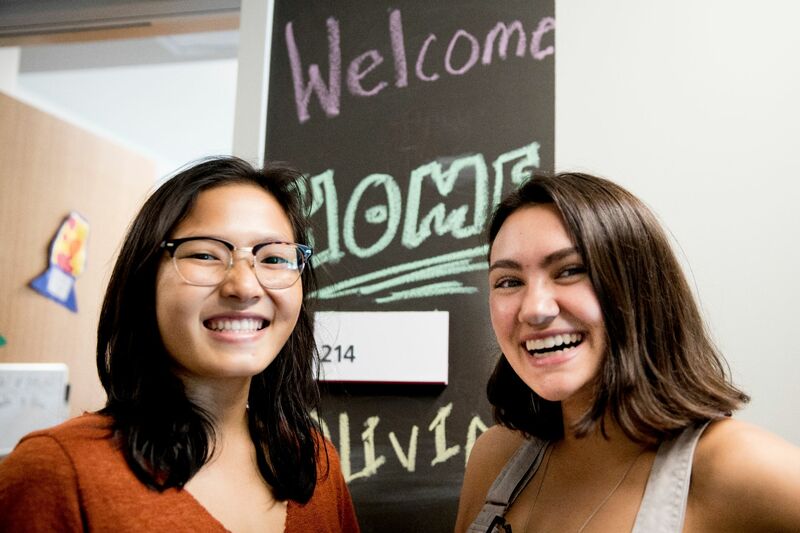 supports first-generation students as they gain a sense of belonging and community on campus throughout their first year, starting with a pre-orientation program. 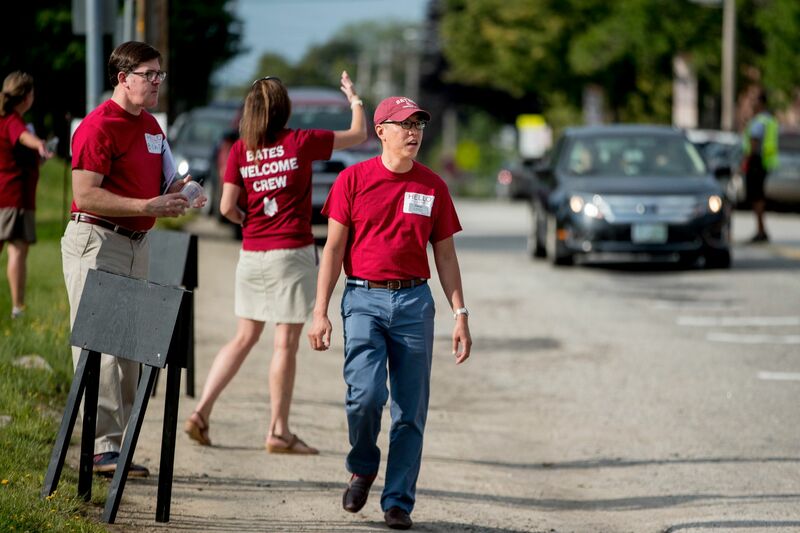 Director of Admission Darryl Uy was part of the garnet-shirted Bates Welcome Crew on Central Avenue, outside Commons. 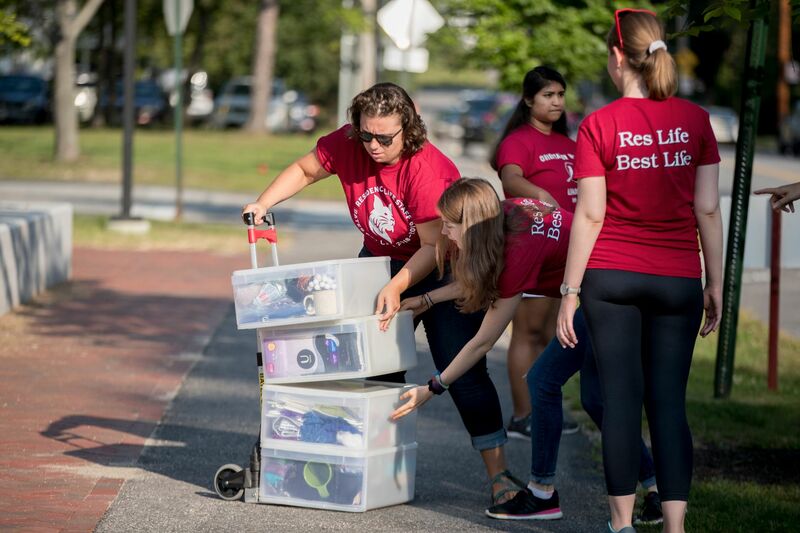 Central Avenue is the arrival spot for most first-years: They exit their vehicles, pick up IDs, and handle other check-in duties before rejoining their families (and gear) at their residences. 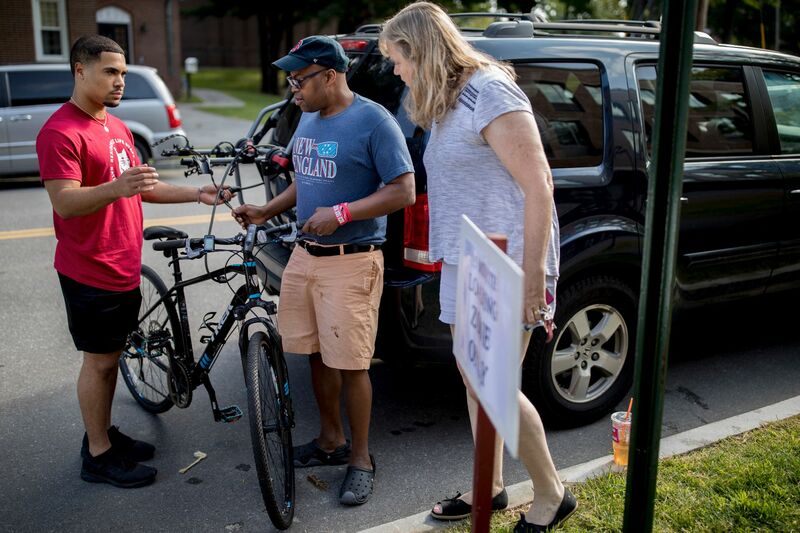 The second that Michael and Carolyn Obel-Omia of Barrington, R.I., pulled up to Kalperis Hall, a group of student helpers, including junior advisor Milan Lemon ’21 of Plantation, Fla., swarmed the vehicle and grabbed gear, including a bike, to carry up to son Jackson’s second-floor room. Jackson arrived from check-in a few minutes later, his newly issued Bates ID on a lanyard. 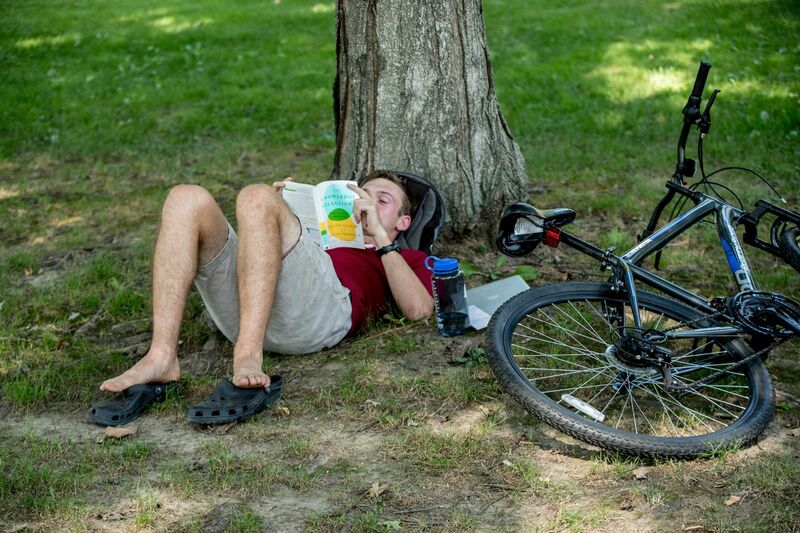 After moving in, he planned to get ready for his late-week AESOP trip on the Grafton Loop Trail, see if he could change a course or two, and dive into his studies — maybe psychology, maybe sociology, maybe a natural science. 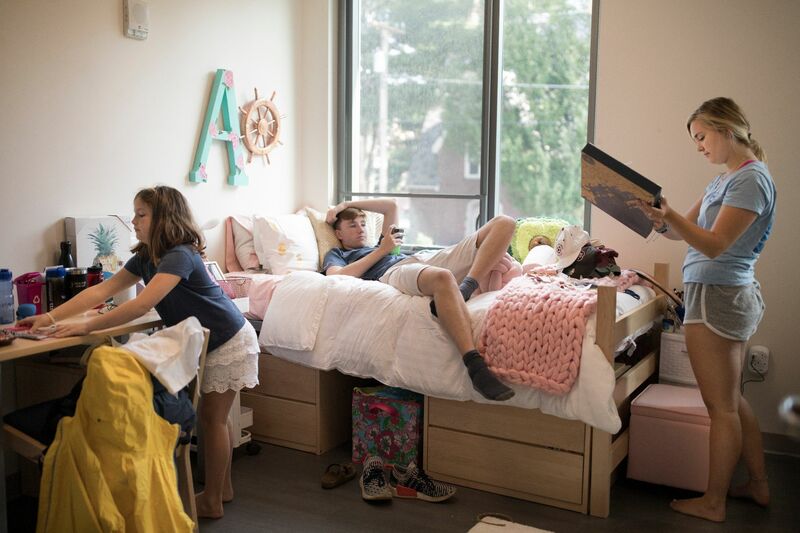 Next door to Obel-Omia, Anna Landgren ’22 of Boxford, Mass., had pretty much finished decorating her side of the room, with the help of her brother Anders, 15, and her sister Lizzie, 8. Asked what her favorite things about the room were, Lizzie pointed out a three-tiered rolling cart and two avocado-shaped pillows. 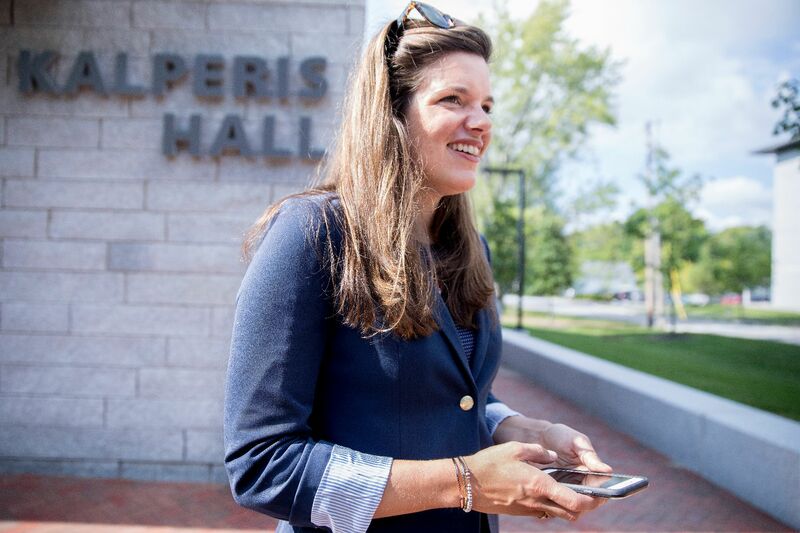 “Everyone’s very excited,” said Molly Newton ’11, assistant dean of residence life and health education, as she made the rounds. For Newton, Opening Day is its own reward. 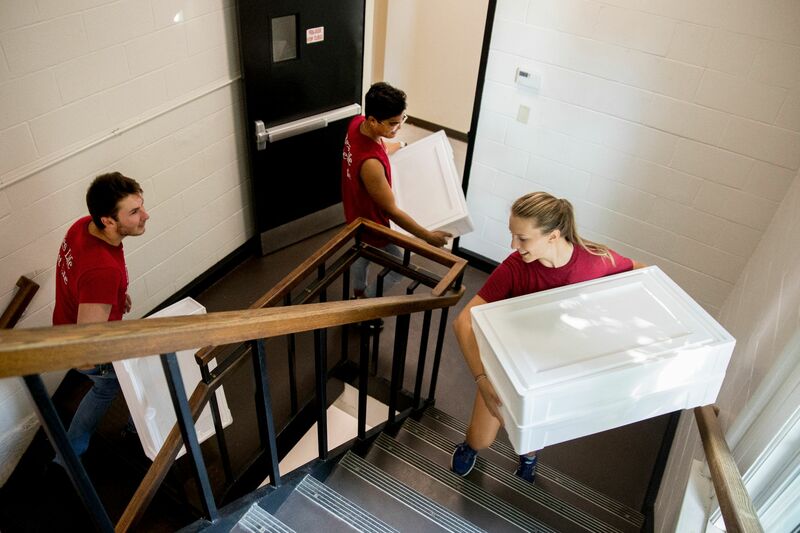 On the second floor of Chu Hall, Opening Day helpers, first-years, and parents darted back and forth between rooms, elevators, and staircases. 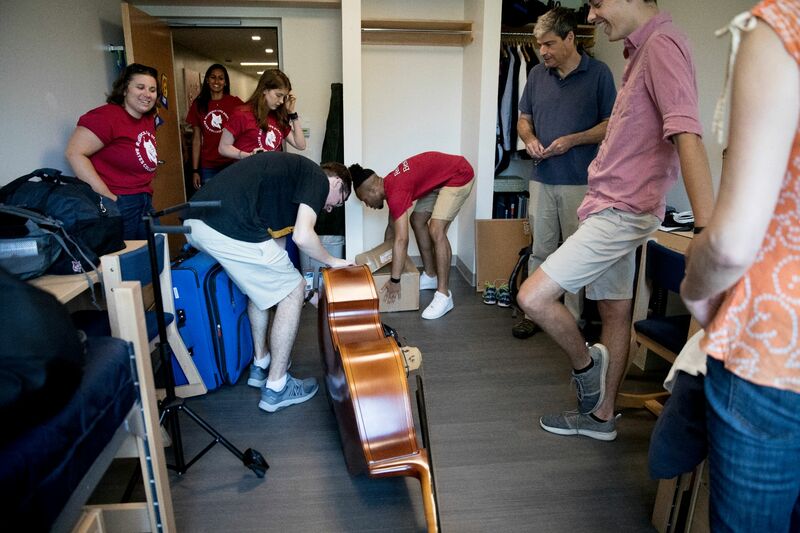 Up came bedding, boxes, and storage containers full of belongings, mini fridges, and, in the case of Peter Philbin ’22 of Bedford, N.H., a double bass. Inside rooms, students made beds, hung up posters, and met roommates. Philbin’s roommate, Noah Pott ’22 of Great Barrington, Mass., brought a keyboard to the room, complementing Philbin’s double bass. “It worked out well,” Pott said. Nearby, Chu custodian Max Payne stood by a large container, happily greeting students and accepting their broken-down boxes. Ashley Cleary ’19 of Albany, N.Y., a junior advisor in Chu, pointed out that things were calmer than they had been a few hours ago. “I was telling one of my friends, ‘It’s like Christmas morning when there starts to be less presents under the tree, and you’re, like, no, I want it to last longer!’” she said. 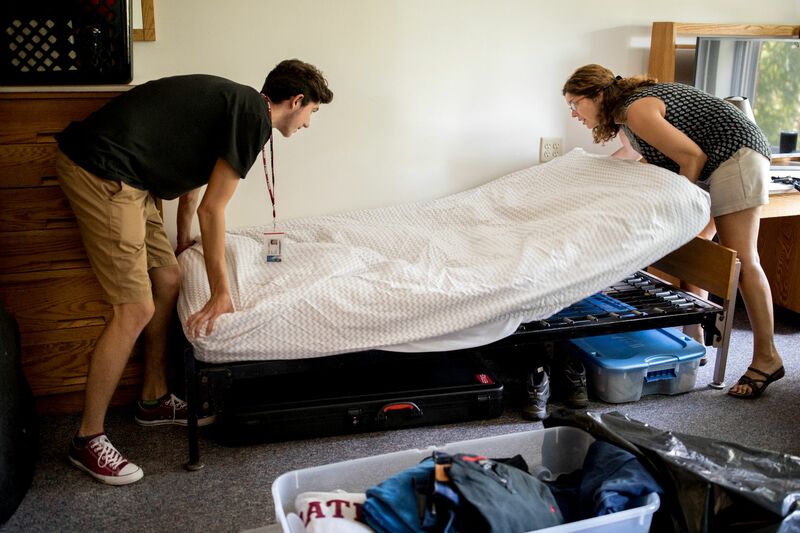 Amanda Becker ’22 (left) of Brooklyn, N.Y., had an extra set of hands to help her move into her room in Chu: her “Bates mom,” Hannah Palacios ’21 of West Vancouver, B.C. Becker stayed in Palacios’ room last October as part of Prologue to Bates, which flies in students from underrepresented backgrounds and introduces them to campus for three days. Becker and Palacios became fast friends, seeing each other at Bates twice more and once at Becker’s home. 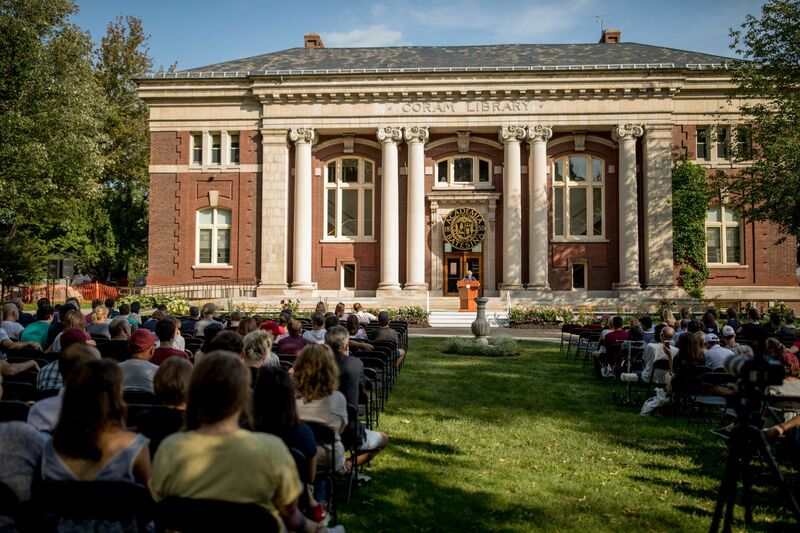 “She’s a huge reason why I chose Bates,” Becker said. Becker, whose high school graduating class was about 40 students, was excited to meet new people and, she said, to learn for learning’s sake, diving deeply into her chosen subjects. “I’m excited to do that with very specific classes rather than just, here’s 100 years of history you have to go through,” she said. After getting everything squared away at his room in Page Hall, Nathaniel Badger ’22 of Edwards, Colo., and his father, Lance, stopped by the bookstore to pick up a T-shirt for his little sister. The Bibro family of Cornish, Maine, were making good strides on unpacking, and all three — Camden ’22, mom Sandy, and dad Ed — helped make his new bed. The pair were impressed by the smooth flow of first-year intake at the other end of Alumni Walk, in Commons. “Very organized, streamlined,” said Faust. “Well-oiled machine,” Bale agreed. “You get your IDs, and your mugs, which we didn’t have freshman year,” said Faust. Helping newbies move in got Faust and Bale thinking about their own arrivals at Bates. 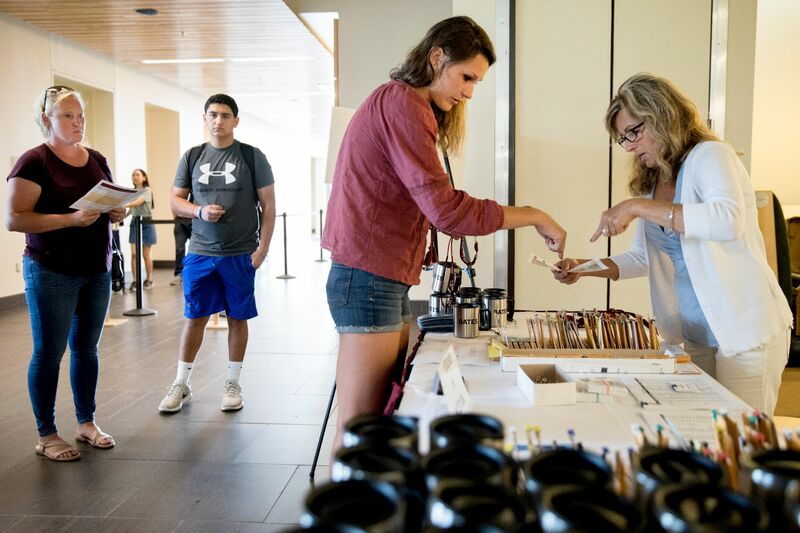 Opening Day features a resource fair in Pettengill Hall’s Perry Atrium. There’s no cotton candy at this fair, but instead a suite of information about various Bates offices programs. Soaking in the new information were, from left, Yueh Qi Chuah ’22 of Petaling Jaya, Malawi, Mathieu Moutou ’22 of Vacoas, Mauritius, and Ognyan Simeonov ’22 of Novi Pazar, Bulgaria. The buffet lines weren’t the only things moving swiftly during the Family and New Student Barbecue. As 1 p.m. approached, international students and families filed into Commons’ Fireplace Lounge for a welcome session with James Reese, associate dean of students for international student programs. There, Reese greeted Biruk Chafamo ’22 of Addis Ababa, Ethiopia, as Ella Fischer ’22 (second from left) of Raleigh, N.C., and Niharika Tuladhar ’22 of Kathmandu, Nepal, waited their turn. Joining Reese in greeting the first-years were Francesca Biondi Morra ’20 of Santa Ana, Costa Rica, and Ahimy Soto-Garcia ’21 of Trenton, N.J. The pair directed the first-years to pick up a sheet of paper with the Concord Coach Lines schedule and a recommended cab company. Members of the International Club, they had been helping Reese welcome the international students since yesterday. Lacrosse head coach Peter Lasagna does something similar every year. After the Athletics Welcome for prospective Bobcats and their families, Lasagna gathers his new players for a heart-to-heart outside Alumni Gymnasium. While their sons listened to their coach, Tim Farrell and Michael Kim, fathers of John Farrell ’22 and Maxwell Kim ’22, chatted on the side. They had met over the summer at a lacrosse tournament in Massachusetts, to which the first-years were invited. 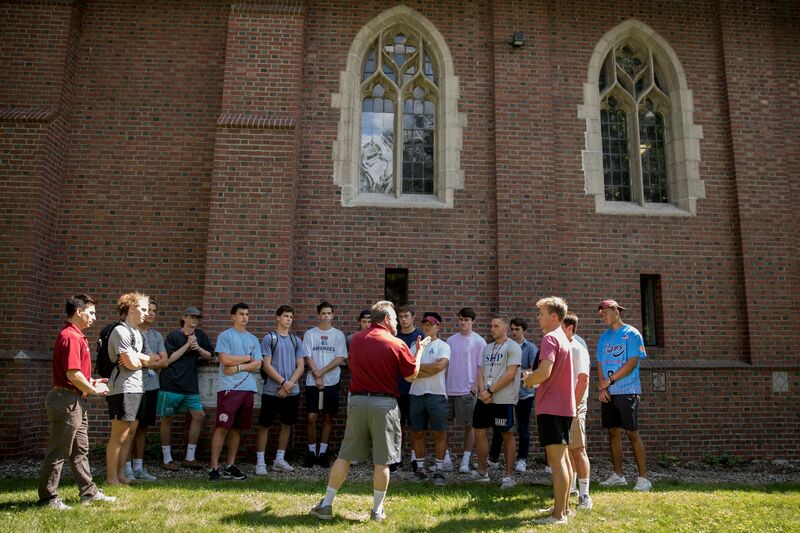 The team’s involvement of new students and parents impressed and reassured the dads — particularly Farrell, whose three older children were athletes at other colleges. “Having a built-in infrastructure and having an adult that’s coached at Brown and coached here for 18 years — he’s got experience,” Farrell said, referring to Lasagna. “I’m really happy about that. “That’s the beauty of a smaller school,” Kim added. 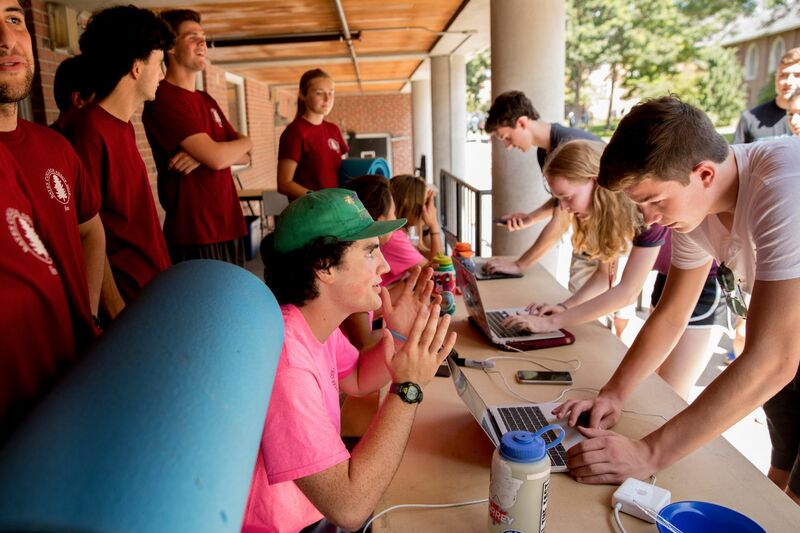 Outside the Chase Hall headquarters of the Bates Outing Club, Peter Griffin ’20 of Beverly, Mass., an AESOP assistant coordinator, helped distribute loaner gear to first-years in preparation for the annual three-day, student-led outdoor trips. AESOP leaders handed sleeping bags, mats, plastic dishware, and other gear to students lined up on the loading bay of Chase Hall. Oliver Barrera ’22 of Waukegan, Ill., picked up a sleeping bag and mat for his upcoming trip to Nezinscot Farms. He and his fellow AESOPers would participate in farm life and eat Nezinscot’s popular homemade food. Barrera was also gearing up to explore his interests in rhetoric and film, including his First-Year Seminar, “Lorraine Hansberry and James Baldwin: Young, Gifted, Black, and Queer,” taught by Charles Nero, Benjamin E. Mays Distinguished Professor of Rhetoric, Film, and Screen Studies. “I love Bates so far, and I’m very excited,” he said. And there was time to just sit and relax on the Historic Quad, outside Hathorn Hall. Besides leading one of the AESOP outdoor trips later in the week, Jake Atwood ’19 of Natick, Mass., is an assistant for a First Year Seminar, “How Do You Know That?” taught by Benjamin Moodie, a lecturer in sociology. Preparing for his work, Atwood found a shady spot in the Historic Quad to read The Knowledge Illusion: Why We Never Think Alone, by Philip Fernbach and Steven Sloman. The Gomes Chapel porch affords a view of the comings and goings on Opening Day. 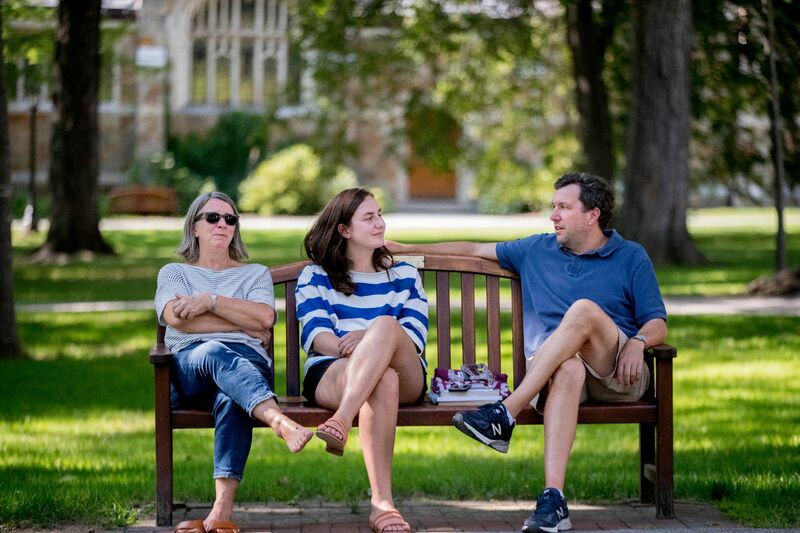 With Opening Day moving toward its close, Margaret Flynn ’22 of Gambrills, Md., sat with her parents, Tonya Flynn and Roger Flynn, on a bench on the Historic Quad. Mom and Day said that it was a “few last moments” to spend with their youngest child. “Who’s going to take care of us at home?” they said with a laugh. 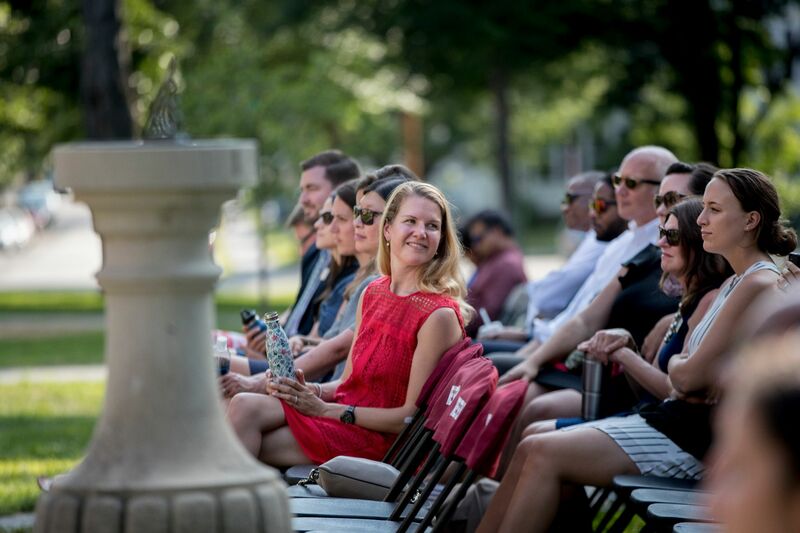 Dean of Admission and Financial Aid Leigh Weisenburger kicked off the college welcome, held in front of Coram Library. “The record-breaking Class of 2022 has arrived,” she said, prompting cheers and applause. 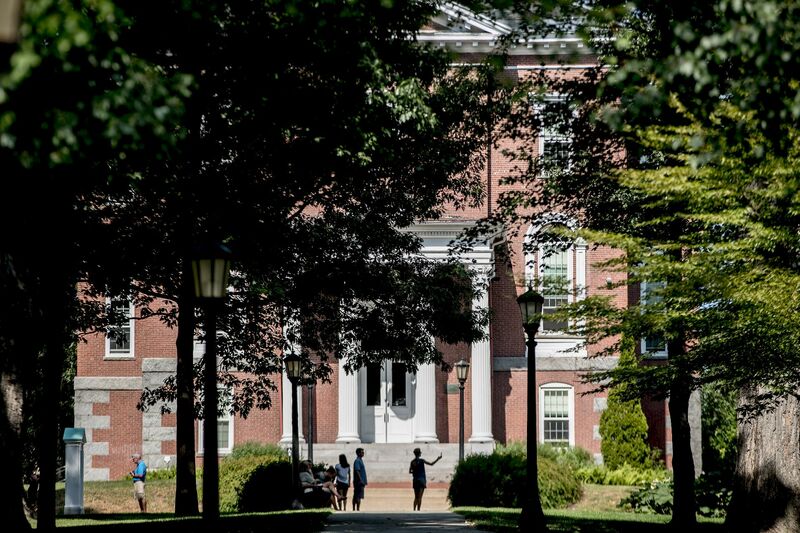 The Class of 2022 was selected from a record number of applications, 7,685. “We are so proud to welcome you and to support you as you learn and grow,” she said. “Congratulations from the entire college: faculty, staff, students and alumni. 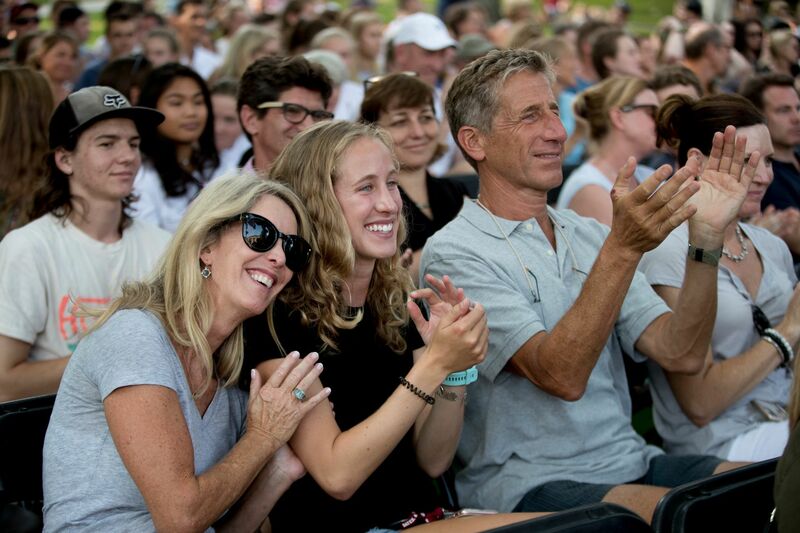 Alixandra Zabin ’22 of Milford, Conn., sits between parents Amy and Steve Zabin as they react to President Clayton Spencer’s welcome address. 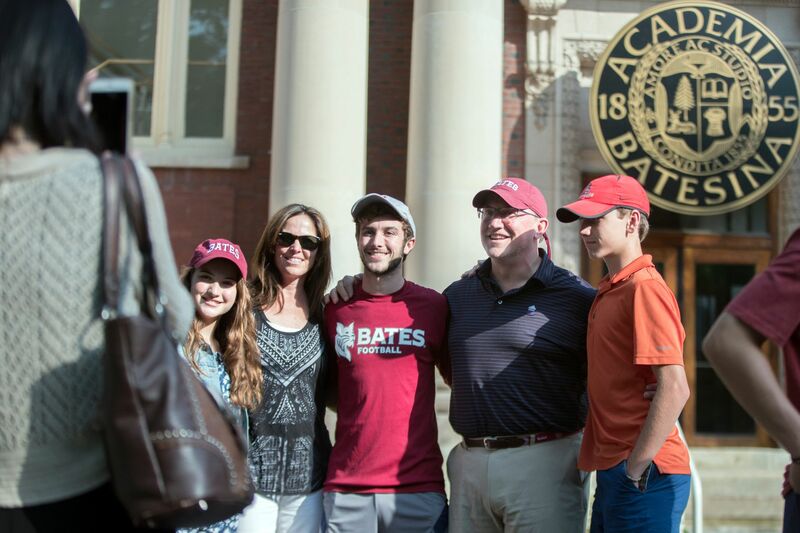 Some parents were seeing Bates for the first time on Opening Day. 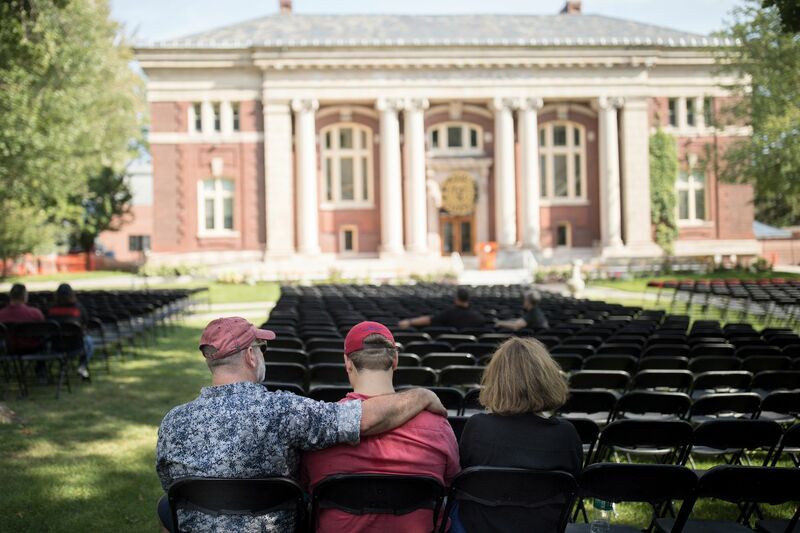 Others, like Steve Brackett ’85, were returning to the embrace of alma mater. Steve and his wife, Kathryn, are the parents of Stephen ’22, and they were accompanied on Opening Day by their younger children, Maeve and Michael. An active Bates alumnus and volunteer, Steve has been back to Bates dozens of times since his graduation. Judging by tears welling in his eyes as he and Kathryn said their goodbyes to Stephen, this was a lot different. In fact, the tears came because he felt something familiar. “It just keeps reoccurring. A feeling of comfort,” he said. 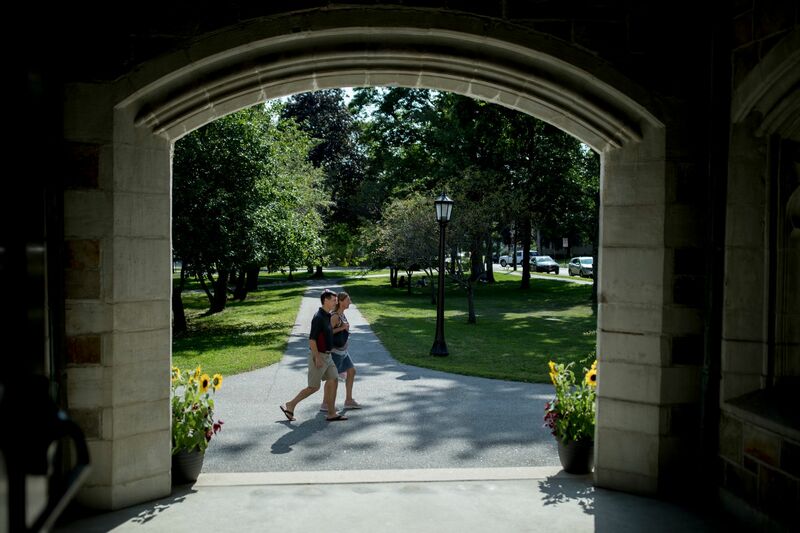 “Now, it’s the feeling of comfort knowing that my son belongs at Bates. 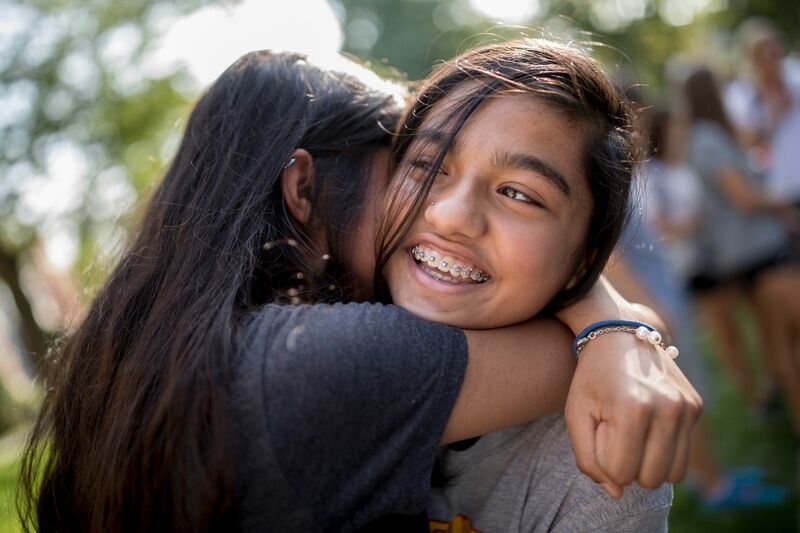 The president’s welcome concluded, it was time for families to say their goodbyes, and time for Neeshi Hullavarad ’22 of Fairbanks, Alaska, to get a big hug from little sister, Esha. 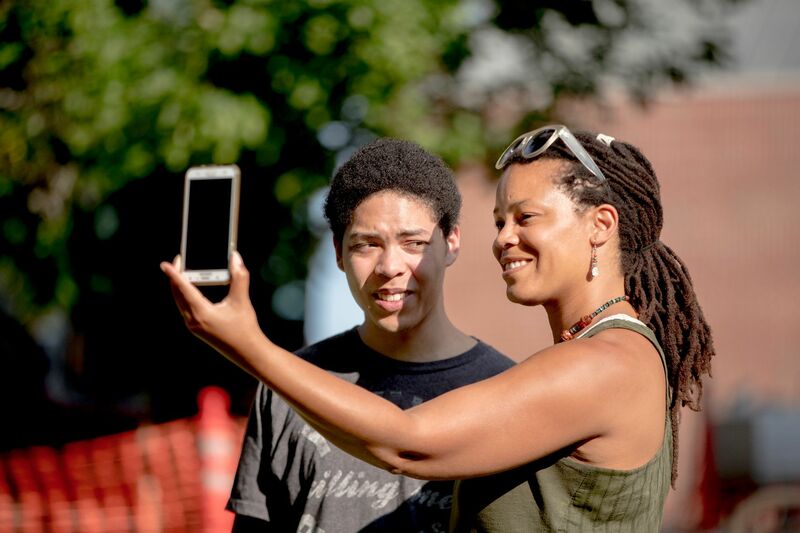 Jamari Amrham ’22 of Richmond, Calif., had his eyes on his mom, Cherie Hill, as she took a selfie. She planned to be in Maine for two more days, looking forward to the quieter pace of Maine in late summer. 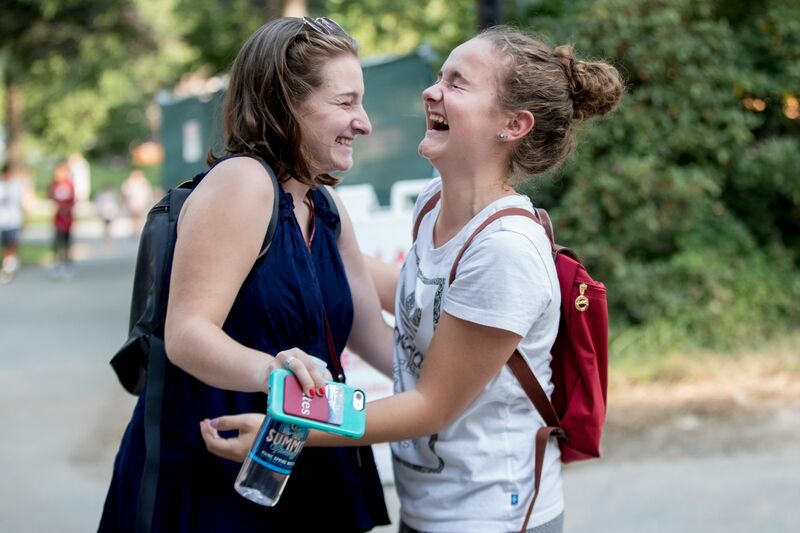 Stella Santucci ’22 and her younger sister, Chloé Santucci of Falmouth, Maine, hugged and laughed as they said goodbyes. Their parents, Jacques and Patricia, are Mainers by way of France, settling in the Portland area in the early 1990s. They noted how the French language, once spoken widely in Lewiston by residents who had emigrated from Canada, was making a comeback thanks to recent immigrants from French-speaking African countries. For Emily Dewey ‘22 of Sudbury, Mass., next up on the schedule was dinner with her Frye House residents and their junior advisor. Then a walk up Mount David to watch the sunset. Then fun class events until late in the evening. 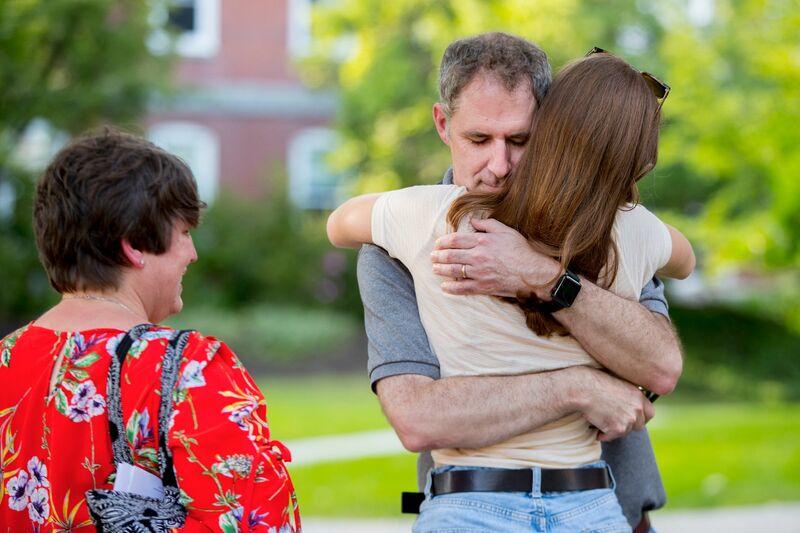 But first things first: hugs for her father, Will Dewey ‘88, and her mother, Susan Luther Dewey ‘88.